The new prime minister, Theresa May, has signalled her intention to deal with the “housing deficit” – the year-after-year shortfall in the number of homes that are built compared with the number of homes that are needed. The government’s target is to build 1 million new homes by 2020, the equivalent of 200,000 a year. Many housing economists think that England needs at least 250,000 new homes a year to keep up with demand. Neither of these targets are being met: last year (2014/15) only 155,000 new-builds were completed. In order to tackle the shortfall it will first be necessary to correctly identify the obstacles. For many years it has been claimed that the planning system is a major barrier to progress on the grounds that it is slow and cumbersome in issuing planning permissions. This briefing note seeks to explain why this is not, in fact, the main problem today. Our analysis shows that potential new homes are granted planning permission in much greater numbers than developers build them out. More units have been permissioned by planning officials than started by builders in every year for at least the past decade – and the gap has been growing ever wider in recent years. Over the past two years, planning permissions have been granted in sufficient quantities to meet a target of 250,000 a year. This demonstrates that the key to building many more homes does not lie in increasing the number of permissions which are granted each year – although that should not be discouraged – but in ensuring that those permissions which are granted are built out much more quickly. This is likely to involve radically shifting the incentive structures which govern the behaviour of landowners and developers who are in possession of those planning permits. Planning permission has been awarded in England for 2,035,835 housing units between 2006 and 2015. That is an average of 204,000 new homes a year – an annual rate sufficient to meet the government’s housebuilding target for this parliament of 1 million homes by 2020. Starts recorded by the government during the same 10-year period numbered only 1,261,350, however: an average of just 126,000 a year. This means that there have been 774,485 more permissions than starts, equivalent to 77,000 a year for the period. This shortfall has been growing wider over the past five years. 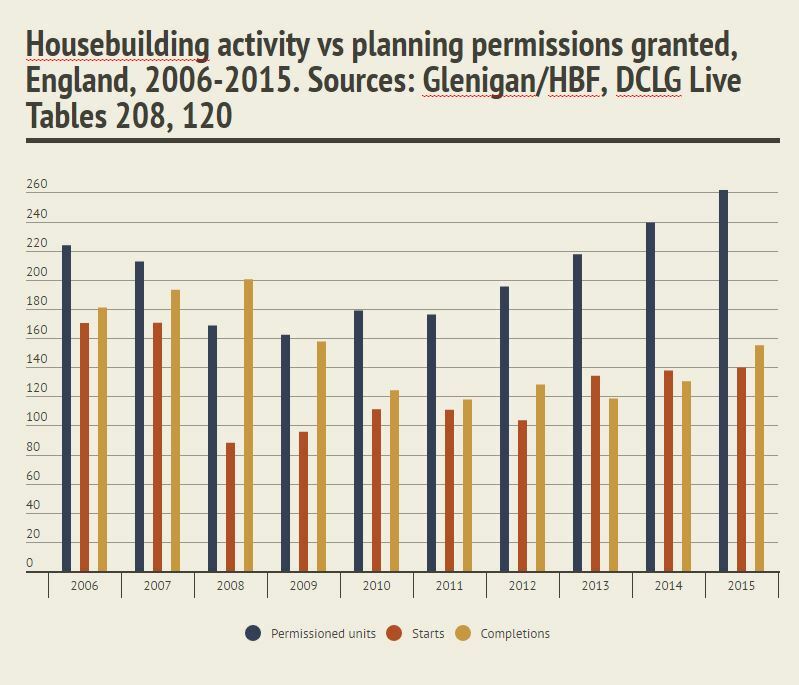 A significant increase in the number of planning permissions granted since 2011 has not been matched by a comparable increase in starts or completions. In the past two years (2014 and 2015), 500,956 units have received permission, in line with the 250,000 homes a year that most housing economists think England needs as a minimum. In neither of those two years did recorded starts get above 140,000, however, little more than half of what has been approved. Does the Social Housing Sector have a landbank for Corbyn’s 1 million homes? A Labour government run by Jeremy Corbyn would borrow £15bn a year to build houses across the country – half of them council homes – as part of a £500bn programme of public investment, new policy papers have revealed. Whilst welcoming expansion of social housing and council house building what evidence is there that councils and housing associations have a landbank of ‘shovel ready’ sites with planning permission to hit this? Councils have sold off most easily developable land and most projects by even the most progressive council involve intensification of existing land such as council estates – which take time. Faced with difficult financials and cuts in funding housing associations have run down their land banks. The fact is such targets could only be hit through private land and their is a huge risk of a public spending induced land price bubble blown up by slow progress on local plans. This policy is introducing a 1950s level of social housing spending to a teenies level of public sector landbanks, a recipe for disaster. The sad fact for those on the momentum left is this policy is unimplementable. It could only stand a chance of success with some form of public sector partnership with existing landowners where profits are shared and where partnership is forced by some form of land tax. There would also need to be dedicated development corporation like delivery bodies to build new sites – that kind of policy can bring back housebuildings to historic post ware levels but would take at least 4-5 years to gear up – especially with the almost total absence of serious masterplanning for large new communities whether inner urban or Garden City. Vale of White Horse is the exception proposing Green Belt Amendments in four areas which the Inspector has accepted. The issue is does this add up to a can of beans. Eynsham makes sense, it is a proposed Park and Ride station and the A40 is to be upgraded. One day the former rail line to Whitney might be restored, possibly as guided bus. “The decision favouring Chalgrove Airfield as the preferred site, largely due to the fact that it is outside Green Belt has to be weighed against the highly likely severe transport implications in a location with such a high degree of inaccessibility and an extreme lack of potential sustainable travel. Of all of Englands Great cities with Green Belts achieving a sustainable strategy for housing and transport for Oxford seems most within reach. The loss of Green Belt at Grenoble road would be comparatively small and it achieves an accessible site around a city where flooding and landscape constraints make expansion hard. It is time for South Oxfordshire to take one for the time and achieve the wider goal of protecting the vast majority of Oxford’s Green Belt for the next generation. We covered this case last year. The district refused a scheme even though it was in a joint local plan it had just adopted. Some heterodox macroeconomists, it’s true, do have quantitative theories. One is “stock-flow consistent” models (a confusing name, since mainstream models also maintain consistency between stocks and flows). He rightly notes that the name is confusing — any correctly specified closed mathematical macro model should be internally consistent and therefore stock-flow consistent. This is certainly true of DSGE models. A correctly specified closed mathematical model will only have a ‘netting’ of flows to zero in one case – equilibrium. In that case you have all stocks no flows – but it cannot handle any out of equilibrium case of its time path – the real world. Because orthodox Neoclassical models are not defined in strict accounting terms – as a balance sheet of assets and liabilities that are unable to model consistency of relations that are defined as assets and liabilities, simple things like assets, debt and money. Crude attempts to overcome this – such as measuring in flows and outflows to a blobby body such as K the stock of capital have irresolvable issues of dimensionality through over over-aggregation. Whatever the arguments over the definitions of neoclassical and orthodox, and the not always helpful chasm this attempts to define, it is clear that economics cannot get out of its funk unless it redefines its basic principles an an accounting and dimension consistent foundation of mathematical identities, starting with the fundamental equation of accounting. Jeremy Hunt when health Secretary claimed that 70,000-80,000 people a year were forced to sell homes to cover care costs. Sadly a figure which dates back to research for the Panorama programme in the mid 90s. Theresa May’s policy chief has suggested that people with valuable homes who face high social care costs in old age should downsize or re-mortgage to cover their bills, the Observer can reveal. Director of policy John Godfrey has suggested that over the next 10 years the solution to the social care crisis lies in people selling up or releasing some of the equity in their property. John Godfrey, Theresa May’s director of policy. Full Fact correctly apply a stock-flow analysis to the argument. What matters is not just the ‘stock’ of people in care but the ‘flow’ of people into care. To obtain that number you have to divide it by the mean stay in care – 2 1/2 years. According to Laing & Buisson’s most recent figures, in 2011/12 175,000 people paid for their own care – an increase on 2009. If we repeat the calculation above, we arrive at a figure of 52,500 self-funders selling their home or 21,000 per year. Lets be clear the supply of new homes on the market is the total of new housebuilding plus the existing stock recycling onto the market. Each house not sold for equity release is one less house released to the market. The Dilnot reforms would have been a disaster for intergenerational equity. The issue of whether a family should be able to retain an asset is conceptually different from the issue over whether they should be required to sell a portion of that asset to release equity. A more carefully tailored policy would cap both care and ‘lodging’ costs at around 150,000 pounds which might be revenue neutral to the treasury. Local authorities should be banned from implementing ‘costs deferral on death’ policies which keep houses empty whilst elderly citizens live in homes. Contra those entering care should be encouraged to sell and downsize heir homes to purchase an annuity which would fund care costs with the remainder of the equity used to purchase a smaller home which would revert to the family on death. This home would be rented to fund the lodging costs of a care home. If there was proper integration of health, housing and social care at a local level then this would result in a flow of 21,000 rental units a year for affordable housing leading to considerable savings to housing benefit and an essential new source of rental housing to younger people. Indeed the scheme could be extended. If capital gains on houses were properly taxed on death tax breaks could be extended for homes released to affordable housing providers in similar schemes.